Kate Hargreaves Book Launch: Jammer Star! 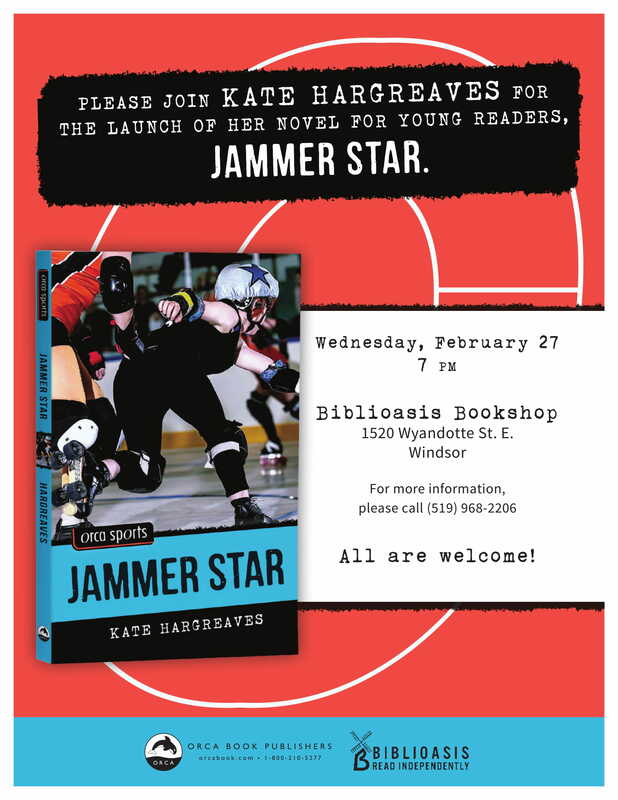 Biblioasis is excited to host local author Kate Hargreaves reading from her new novel for young readers, Jammer Star! Sixteen-year-old Robin Ellis (aka Robin CookieJars) wants to be the best jammer on her roller-derby team and maybe one day play for the Creek City Roller Derby All-Stars like her idol, Annie Mossity. But star junior player April Reid (aka April Powers) always seems to be one lap ahead. Until recently, that is. Robin has noticed that April has been losing a lot of weight, and her game is suffering. This may be Robin’s chance to finally grab the MVP title. But her success may come at a very heavy cost. Kate Hargreaves is a writer and award-winning book designer in Windsor, Ontario, where she also works as a university academic writing advisor. She is the author of two books about roller derby– Jammer Star (Orca) and Talking Derby: Stories from a Life on Eight Wheels (Black Moss)– as well as a collection of poems, Leak (Book*hug). She helped to found Windsor’s roller derby league in 2010 and continues to play derby regularly. She spends the rest of her free time cycling as fast as she can and cuddling with her black cat, Winn.